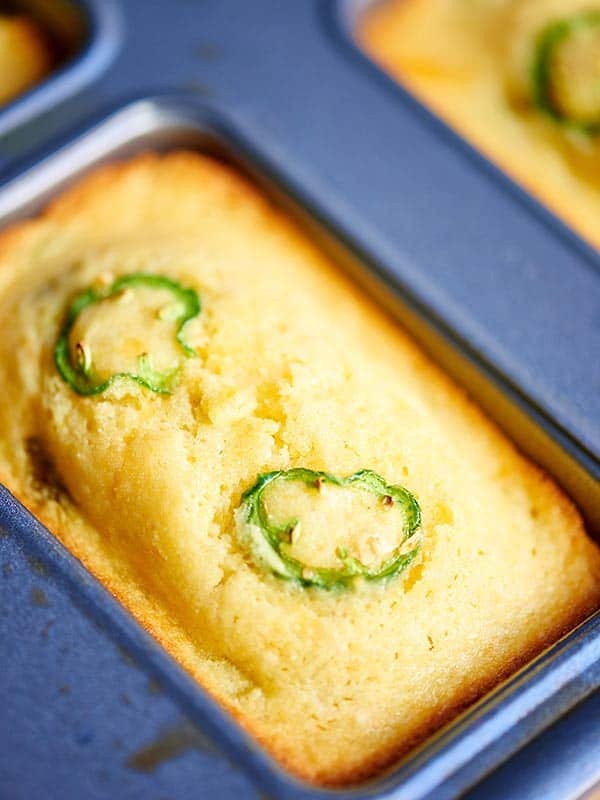 This one bowl jalapeno cheddar cornbread is an easy, less mess, one bowl, delicious addition to your Super Bowl! 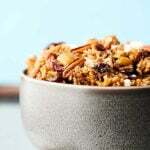 It’s moist, a little bit sweet, so tender and thick, and has the right amount of spice! The perfect companion to chili! Speaking of football games…the Super Bowl is upon us! Anyone else counting down? I am! Why? You don’t care about football, Jennifer. 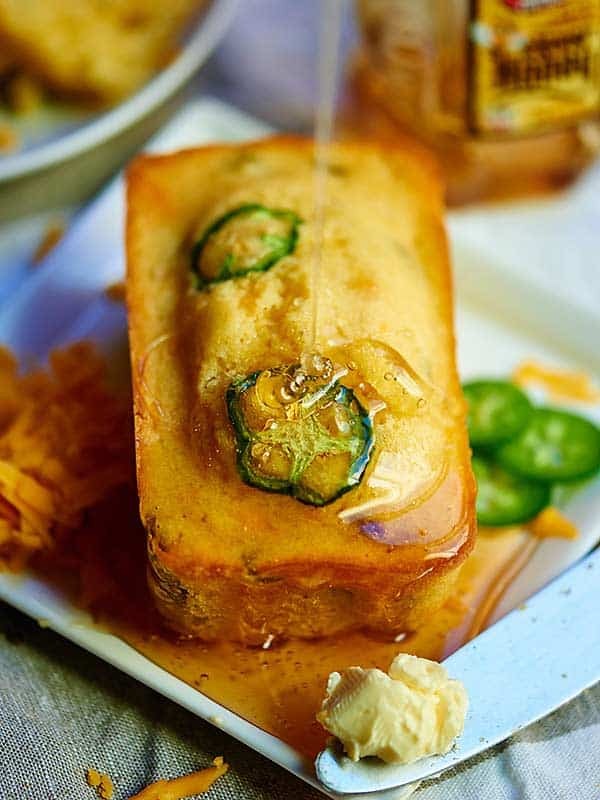 Well, I may not care about the actual game, but I love getting together with friends, and I LOVE the food, because let’s be honest, what’s the Super Bowl without amazing food like….one bowl jalapeno cheddar cornbread?! As you may have noticed, I really like jalapenos. I love jalapeno poppers, jalapeno hummus, and spicy spinach artichoke dip! 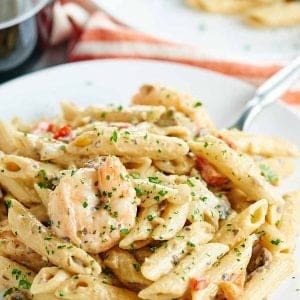 I also really like one bowl recipes, because there’s nothing worse than making or baking something amazing, only to have that pile of dirty dishes taunting you from the sink. It’s a total buzz kill. 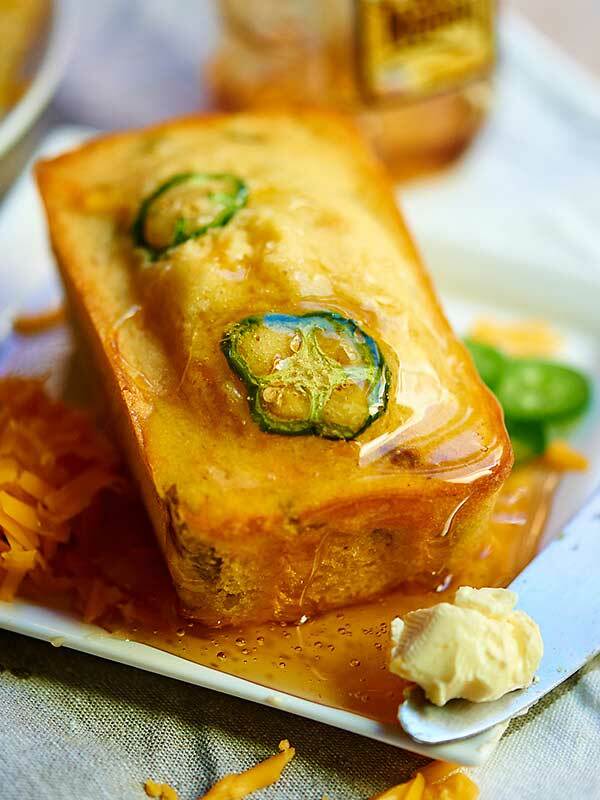 Well, this one bowl jalapeno cheddar cornbread is spicy and requires, ummm yeah, one bowl…no slaving away on Super Bowl Sunday and everyone will love it! A. Because it’s so dense and moist? B. The subtle corn flavor? C. The honey that it gets smothered in? I’m gonna say D, but I’ll leave that up to you. Now. I have something to tell you and I’m a little nervous about it, because you’ll either love it or you’ll hate it. 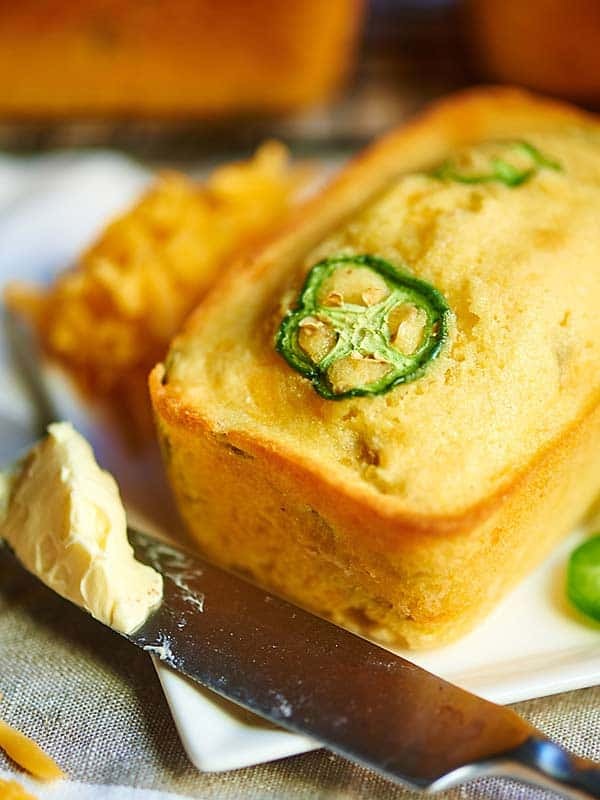 This one bowl jalapeno cheddar cornbread recipe contains sugar. Start by melting a stick of butter in a microwave safe bowl. Microwave the butter for 30 second intervals until the butter has completely melted. Then whisk in some granulated sugar. Next, whisk in two eggs. 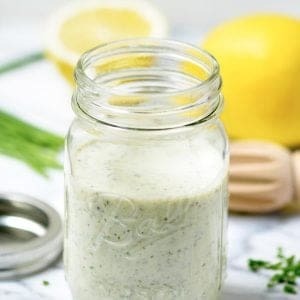 Now you’re going to mix together some buttermilk and baking soda and pour this into the mixture. Stir until well combined. 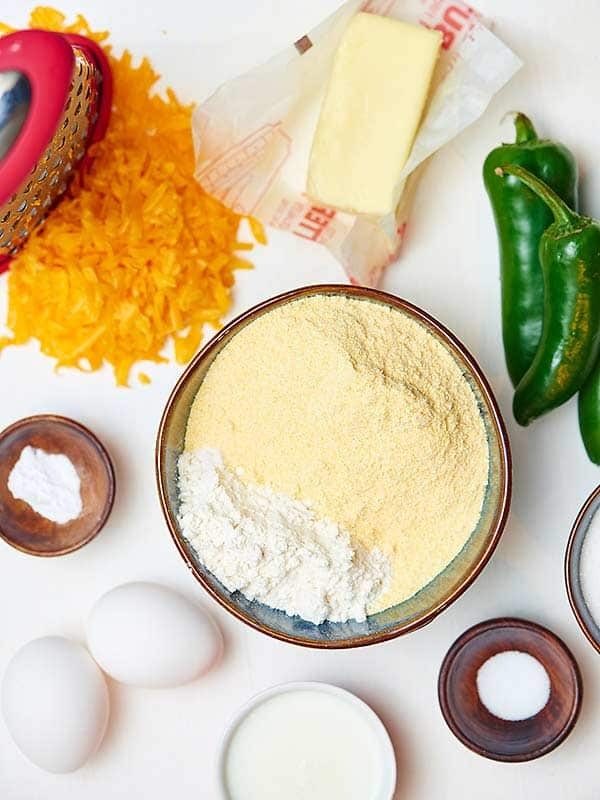 Lastly, pour in cornmeal, flour, salt, shredded cheddar cheese, and canned diced jalapenos! Make sure you mix this until the mixture is *just* combined. Don’t over mix, or you’ll end up with tough bread! Preheat your oven to 375 degrees F and prepare a pan with cooking spray. I used a mini loaf pan very similar to this mini loaf pan , but an 8 x 8 pan would work, too! Although, the cooking time may vary. 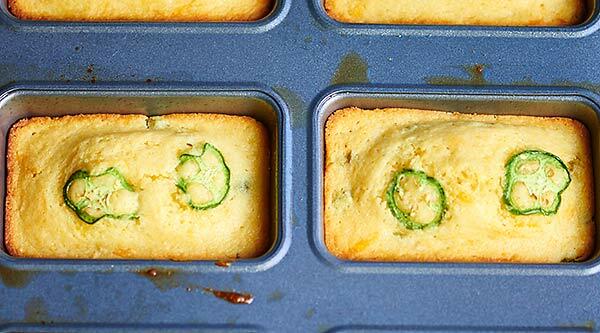 Spoon the batter into the prepared pan and top the batter with thinly sliced fresh jalapenos. 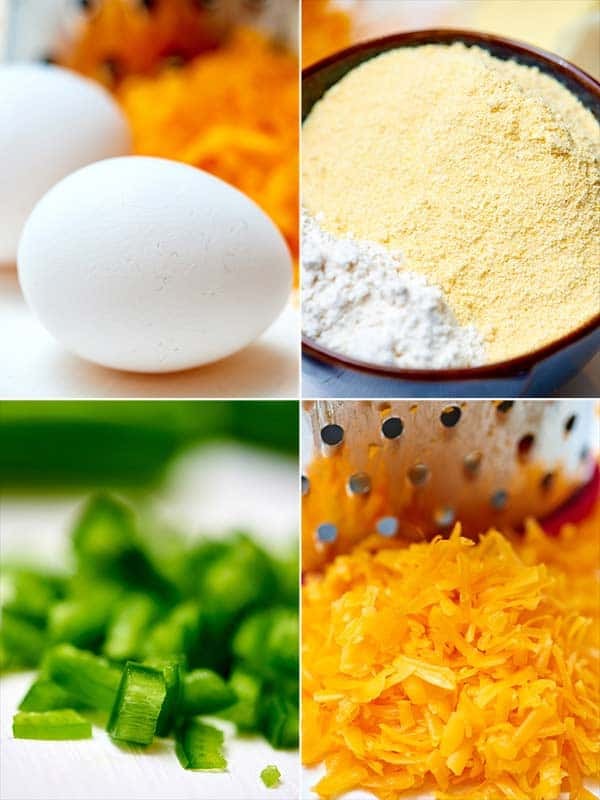 Bake for about 25 to 35 minutes – again, the cooking time may vary depending on the size of your pan. Remove from the oven, and let the loaves cool in the pan for a few minutes. Then, remove from the pan and let set on a cooling rack until you’re ready to serve! 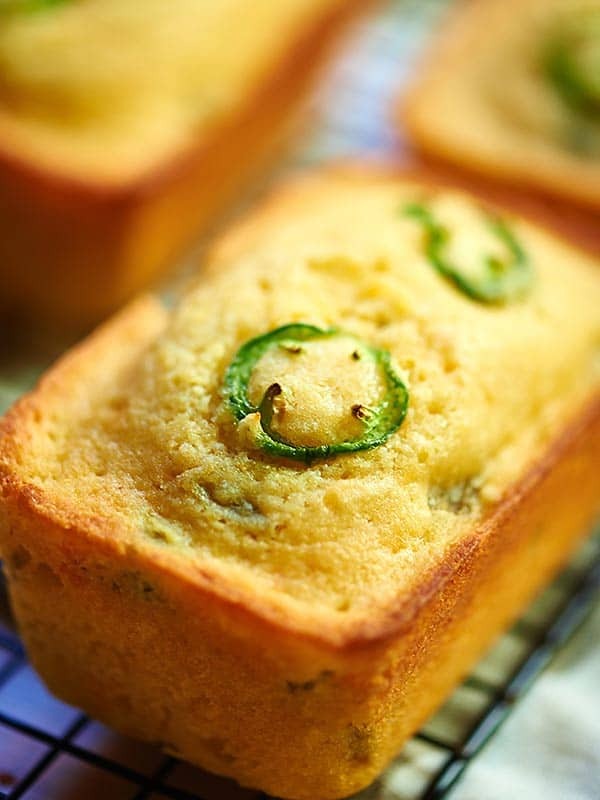 This one bowl jalapeno cheddar cornbread is an easy, less mess, one bowl, delicious addition to your Super Bowl! 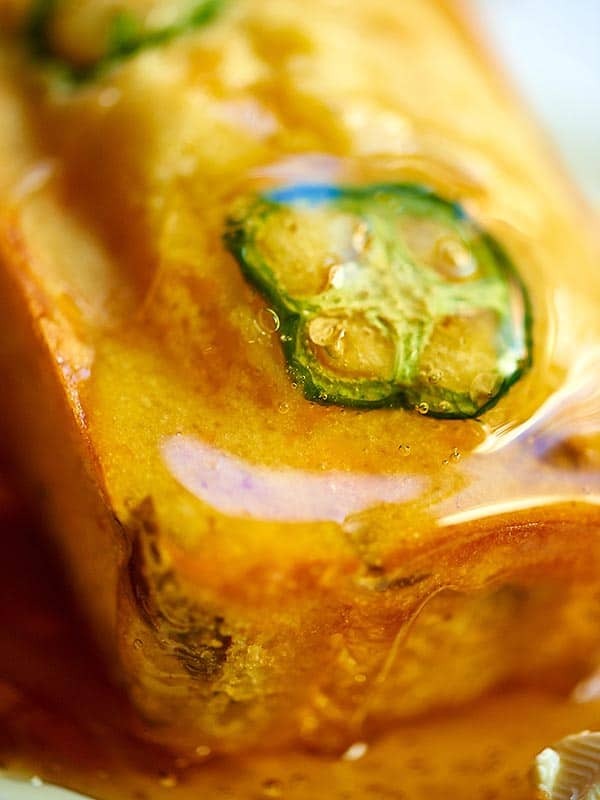 It’s moist, a little bit sweet, so tender and thick, and has the right amount of spice! The perfect companion to this, of course, is my chili! So make sure to check out my Turkey and Vegetable Chili recipe! What are some of your favorite Super Bowl snacks? More Super Bowl recipes will hopefully be coming your way! Show me the yummy! 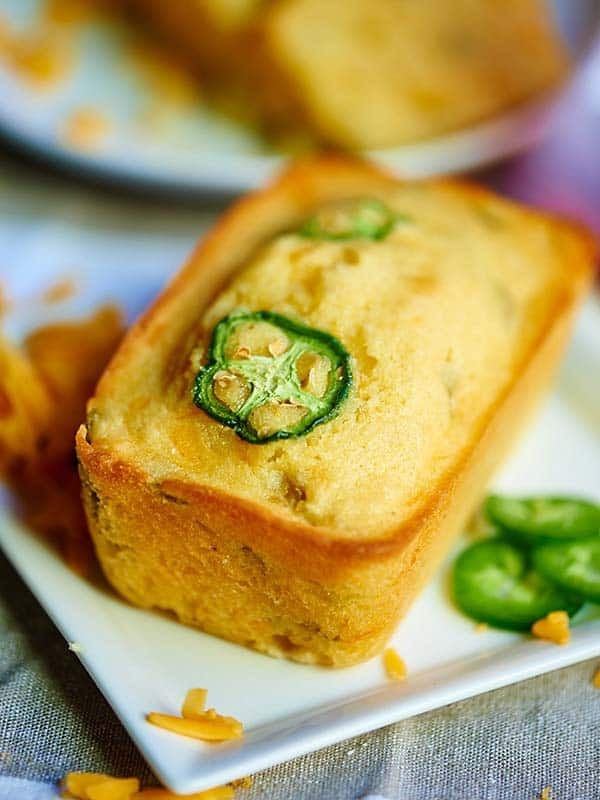 This one bowl jalapeno cheddar cornbread is an easy, less mess, one bowl, delicious addition to your Super Bowl! 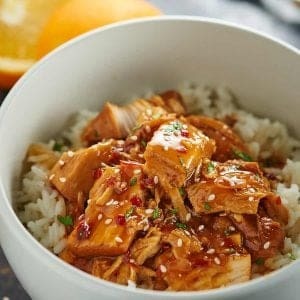 It's moist, a little bit sweet, so tender and thick, and has the right amount of spice! The perfect companion to chili! 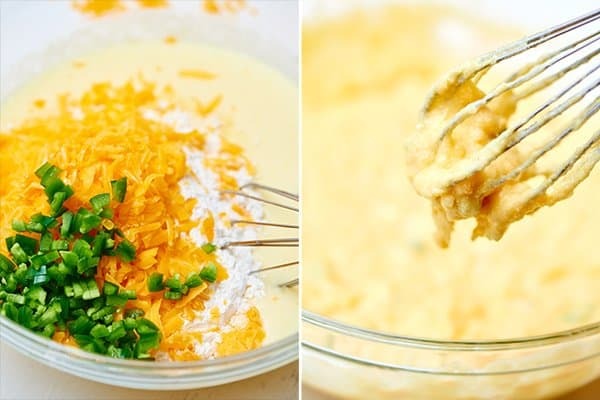 Now you're going to mix together some buttermilk and baking soda and pour this into the mixture. Stir until well combined. 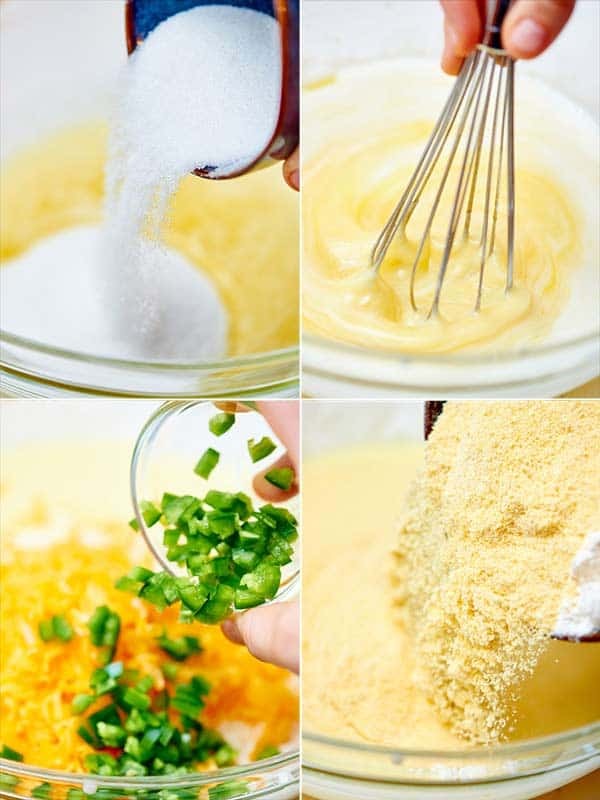 Lastly, pour in cornmeal, flour, salt, shredded cheddar cheese, and canned diced jalapenos! Make sure you mix this until the mixture is *just* combined. Don't over mix, or you'll end up with tough bread! Preheat your oven to 375 degrees F and prepare a pan with cooking spray. I used a mini loaf pan very similar to this mini loaf pan, but an 8 x 8 pan would work, too! Although, the cooking time may vary. 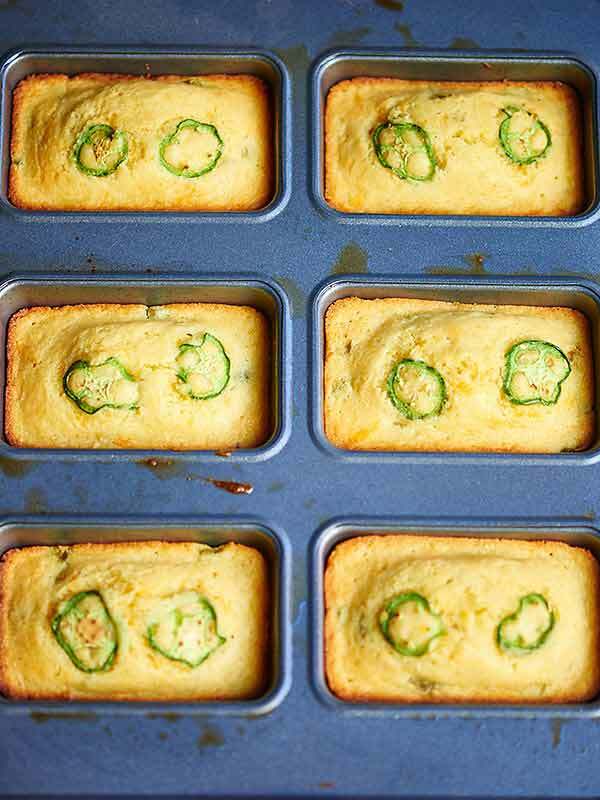 Spoon the batter into the prepared pan and top the batter with thinly sliced fresh jalapenos. Bake for about 25 to 35 minutes - again, the cooking time may vary depending on the size of your pan. Remove from the oven, and let the loaves cool in the pan for a few minutes. Remove from the pan and let set on a cooling rack until you're ready to serve! 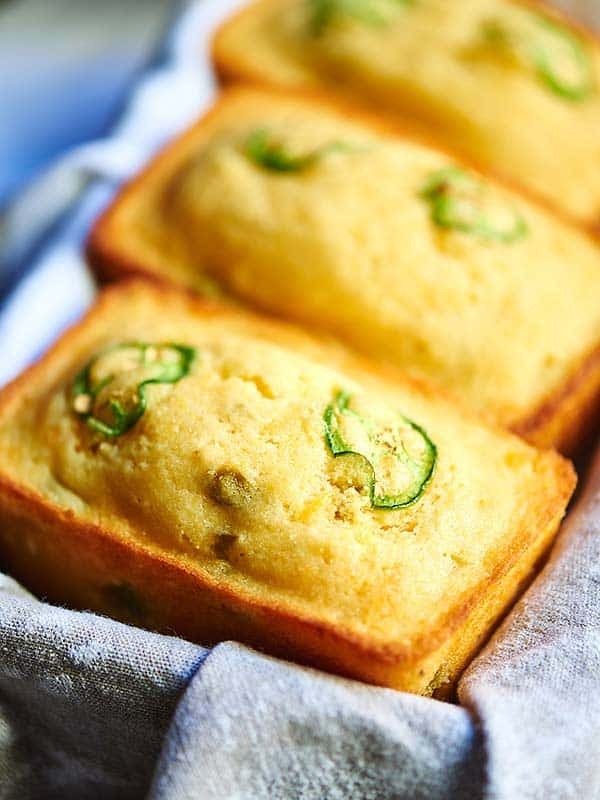 I only watch football for the food, too 🙂 Love the cornbread and LOVE the mini loaf pan – need to get one of those! Holy yum!! These pictures are making my mouth water!! 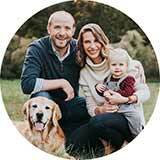 I love one-pot dishes too… I have a problem where I love to cook, but not to clean – which can pose a problem if you spend as many hours in the kitchen as I do cooking. 🙂 Can’t wait to try this! Haha! Exactly! I love the cooking part, but my kitchen is messy 90% of the time now 😉 Hope you get a chance to try them! 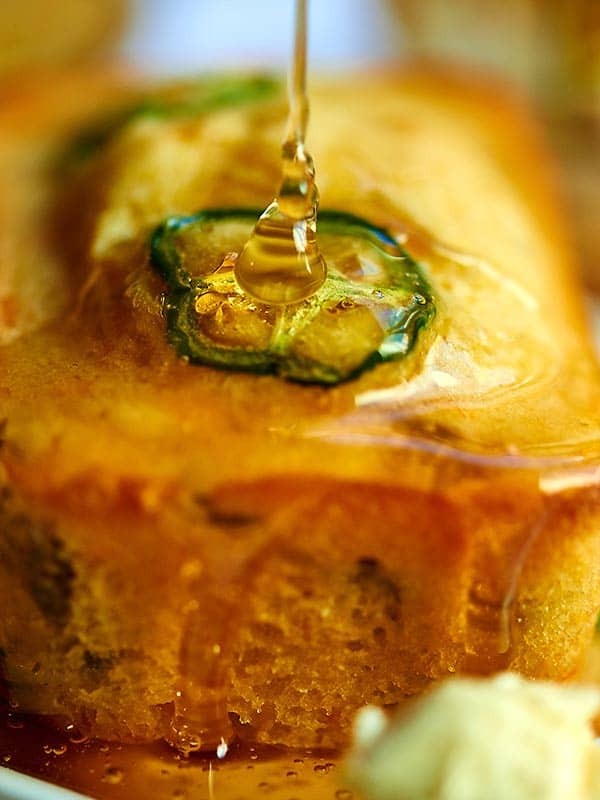 These cornbread just look SO delicious.. craving one with a whole lot of butter and honey right now!